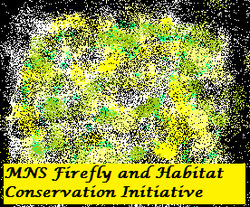 What is a Congregating Firefly Zone? Congregating Firefly Zone (CFZ) refers to the full extent of the habitat of firefly colonies, often located along both sides of a reiver or a tributary or even an artificial waterway like a canal. It stretches from the margin of the river (display tress) to the back of the mangrove or tidal flood plains where the firefly larvae and their prey, such as snails, are found and where unmated adults rest during the day. The entire life cycle of the mangrove congregating fireflies is entirely dependent on the mangrove ecosystem. Any minor alteration to the mangrove ecosystem that the life cycle of the fireflies revolves on, such as the loss of the food prey of the firefly larvae e.g. the mangrove snails Cyclotropis carinata, and the continued survival of the display trees e.g. Berembang Sonneratia caseolaris or the nypa trees Nypa fruticans, where the snails (prey) are found, will drastically affect the continued existence of the Pterotix tener. Firefly larvae which emit a weak light glow are carnivorous. They feed on snails or other invertebrates which is found only on these coastal riverbanks. The lifecycle of the fireflies are therefore intricately linked to the entire river basin. During the 2013 North Selangor Peat Swamp expedition organized by the Forestry Department, a confirmation of the existence of fireflies in peat swamps, not reported before. Preliminary findings showed that the subfamily Lampyrinae (possibly two to three species) and Luciolinae (possibly two to three species) is represented. A possible sighting of another bioluminescence beetle family is present. Another species was unknown high above the canopy.